Do you need to make an impact with your marketing materials and need some fresh ideas? As a Print Broker we are connected with the leaders in the print industry and have the latest ideas and products in the industry at our disposal. When one of our suppliers presents us with a new product or process we are immediately considering client applications. Postcards are an item we specialise in. Having provided these for CBRE for over 3 years, and on a 24 hour turnaround in most cases, we like to feel as though we are somewhat of a specialst in this area. We never let our customers down with the quality of each piece and especially our customer service. Brochures have also become an item that we have produced in very large quatities. 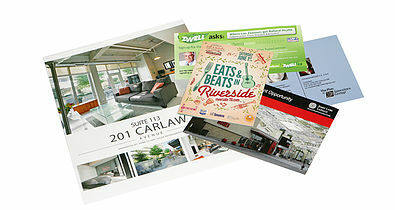 A great looking brochure can be an asset to any business. We can also help you with design services, so call us and we can start the process. Presentation folders or pocket folders as they are also known, can be a huge asset to your marketing materials package. We can provide you a simple set-up to keep costs down, or provide quotes on a more custom folder including embossing, matte lamination and spot UV. Talk to us about what you're looking for and we'll provide some ideas that might help you looking as polished as you can be. Making your products and services stand out in a crowded market place or trade show floor is our specialty. You don’t want to look like all of your competitors and you can rely on MLB Print Management for creative solutions to your marketing challenges. Whether it be for your next conference or trade show display, ideas for client recognition, or creative approaches for your sales efforts, MLB will provide you with the creative input to make your marketing efforts unique and successful. For our clients this means that when you come to MLB with a marketing challenge we will provide you with a range of solutions from tried and trusted to new and innovative. Our clients have always loved our ability to provide them with great pricing on items for their trade show. Whether its fabric tensioned walls, flags, retractable banners or even a simple A-frame, we've can help anyone looking for these types of materials.